Apply Actions for the links on the chain. Apply the Values compare operator for the condition. Apply Selected values with a Multiselect operator for the condition. Apply the Resolves parameter values for the condition. Apply the Parameter’s compare operator for the condition. If using static controls, you must apply conditions for each link in the chain. Conditions need to be created for each value of the control chained from, and those values must be mapped to the correct value(s) that will be displayed in the control that it is being changed to. The Properties and settings dialog box appears when creating a condition for a chain link on the Parameters tab. A chain contains conditions for each link in the chain. The conditions are linked to the values being selected in the control object. The properties and settings for the condition inherit the values of the prior bound control and provide additional condition settings. This section describes the additional condition settings. The conditions list enables you to create multiple conditions for the link. Default is the only initial condition. To create a new condition, click the New icon. Condition(n) is created, where n is the number, and added to the Conditions drop-down list. You may type in a unique condition name, choose Selected values, and set the condition settings. Click the Delete icon to remove the selected condition from the list. Note that the Default condition name cannot be deleted. Populate, show. Populates the control and displays it at run time. This is the default action for all conditions. Populate, hide. Populates the control and does not display it at run time. Populate with alternate, show. Populates the control with alternate values derived from a procedure, or value list, that is not the default and displays the control at run time. Populate with alternate, hide. Populates the control with alternate values derived from a procedure, or value list, that is not the default and does not display the control at run time. Show. Shows the control but does not populate it. Hide. Hides the control but does not populate it. Execute. Executes the bound object. For example, if you bind a control to a Submit button and change the value in the control at run time, the report/graph automatically executes when you change the value, without having to click the Submit button. Select. Selects the bound object. For example, if you bind a control to a tab item and select a value in the control at run time, the bound object (the tab item) is automatically selected as the active tab on the page. Values compare operator provides chaining logic scenarios to include options, such as Equal, Not Equal, Greater Than, Less Than, and so on. This option sets the condition for how to populate the control being linked to. Equal is the default Values compare operator. Selected values enable you to provide the values used in the condition. When creating a new condition, the Selected values section is activated. You may type selected values in the input box or click the ellipsis button to select values from the list. The list of values that appears is based on the values of the prior bound control in the chain. When selected values are entered, the Multiselect operator field is activated. The Multiselect operator options are activated when selected values are entered for the condition. Options are One of or All of. One of is based on one of the values shown in the Selected values, being selected in the prior control, in the chain. All of is based on the value of all of the Selected values, being selected in the prior control, in the chain. One of is the default multiselect operator. From. The From field specifies where to get the value used in the To field, if the control being chained from is a map or ActiveX control. To. The To field is used to dynamically generate the selection list used to populate the control being chained to. This field displays the parameter whose value will drive the condition evaluation. The parameter name linked to the prior control in the chain is displayed by default. The ellipsis button provides a pop-up dialog of the other parameter values (from the report) to be resolved. The Parameter’s compare operator provides chaining logic scenarios to include options, such as Equal, Not Equal, Greater Than, Less Than, and so on. This sets the compare operator to populate the control. Equal is the default Parameter's compare operator. For details about the Properties and settings dialog box options for Data type values, see Properties and Settings (Incoming Static Parameter and Unbound Control) or Properties and Settings Dialog Box (Dynamic Values). Insert a report with parameters in HTML Composer. For details about creating parameters, see Creating Parameter Values. Drag control objects on the Parameters tab to create a chain. Chains are represented by lines connecting control objects on the Parameters tab. Chaining controls will populate parameters with values at run time, based on values selected in prior controls on the chain. For details about chaining controls, see Chaining Controls on the Parameters Tab. Click a link in the chain. The Properties and settings dialog box opens showing the bound control values and the Default condition settings for the link in the chain. Click the New icon to create a multiple condition for the chain. Condition(n) is created, where n is the number, and added to the Conditions drop-down list, and the Selected values section is activated. You may type in a unique condition name. You may type in a unique condition name, choose Selected values, and set the condition settings for the new condition. Optionally, you may click the Delete button to remove the selected condition from the list. Note: Default, the initial condition, cannot be deleted. Close the Properties and settings dialog box. The Properties and settings dialog box opens showing the bound control values and the condition settings for the link in the chain. Select the action for the condition from the Actions drop-down list. For example, to hide the control being chained to, select Hide. Populate, show is the default option. When running the HTML page, the action for the chained control is applied. Drag the control objects on the Parameters tab to create a chain. Select the chaining logic for the parameter being chained to, in the condition, from the Values compare operator drop-down list. Equal is the default option. The compare operator is applied to the value selected. Chaining controls will populate parameters with values at run time, based on values selected in prior controls of the chain. For details about chaining controls, see Chaining Controls on the Parameters Tab. You may type selected values in the input box or click the ellipsis button to select values from the list. Tip: You may also use the pop-up icons to select a field and close the pop-up dialog. The green icon is OK, the red icon is Cancel, double-clicking a value will select the value and close the dialog without using any button, and pressing the Esc key will cancel the dialog without using any button. Select the chaining logic for the selected values from the Multiselect operator drop-down list. One of is based on one of the values shown in the Selected values, being selected in the prior control, in the chain. This is the default selection. All of is based on the value of all of the Selected values, being selected in the prior control, of the chain. The selected values and multiselect operator are applied to the condition. The following example shows how to use the All Of multiselect operator when you perform conditional chaining. In this example, listbox2 is chained to the multiselect listbox1. The listbox2 is conditionally chained to be shown if all of the selected values in listbox1 meet the listed criteria. If all of the selected values do not meet the criteria, listbox2 will be hidden. Select the HTML Files folder from your project in the Developer Studio Explorer. Right-click and select New, then HTML File. The Add HTML File dialog box opens. Type allof_example in the File name text box and click Open. Click No, Thanks to create a blank HTML page without using a template. Add a multiselect list box to the canvas, dynamically populated using the Car data source. From the Insert menu, select Controls, then List Box. Drag the crosshair to create a list box and adjust it to the size you want. Select Properties and Settings from the View menu. The Properties and settings dialog box appears. Select the Dynamic radio button for the Data type. 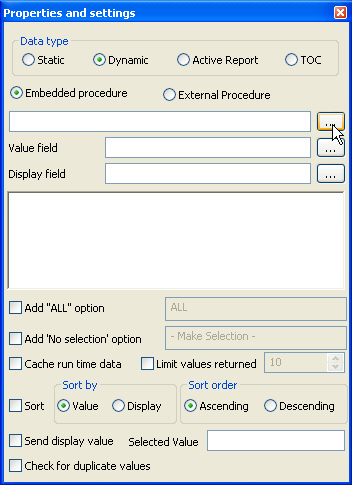 Select the ellipsis button from the Embedded procedure field, as shown in the following image. Select the car Master File from the Get source file dialog box and click Open. Select the ellipsis button from the Value field. Select SEATS from the drop-down menu. Set the Multiple property to Multiple from the Properties pane. The listbox1 is now a multiselect list box. Add a second list box to the canvas, dynamically populated using the Car data source. Select the ellipsis button from the Embedded procedure field. The Get source file dialog box appears. Select the car Master File and click Open. Select CAR from the drop-down menu. Select listbox1 on the canvas. Resizing anchors appear around the list box. Hold down the Ctrl key and select listbox2. Resizing anchors appear around both list boxes. Select Add to current chain from the Utilities toolbar, as shown in the following image. Set conditions for the chain. Right-click the arrow connecting listbox1 to listbox2 and select Properties and Settings. For the Default condition, set Actions to Hide. Press the New Condition button to create a new condition. There is no default selection for listbox1 and by default listbox2 is not displayed when the page is first run. Select any single value less than 5 fulfills the condition set in step 5 and listbox2 is shown. Selecting 2 and 4 also fulfills the condition, all of the multiselected values are less than 5 and listbox2 is shown. Selecting 2 and 5, 4 and 5, or 2, 4, and 5 does not fulfill the condition, all of the multiselected values are not less than 5 and listbox2 remains hidden. The following image shows all of the selected values meeting the condition and, as a result, listbox2 is shown. The following image shows all of the selected values failing to meet the condition and, as a result, listbox2 is hidden. It is recommended that you populate the controls first, before chaining. When you populate the controls first, certain information is obtained, which allows the determination of the best choice for Resolves parameter. If you chain first and then populate, the information cannot be obtained, because the chaining is already established. If you chain first, you must manually set Resolves parameter. Click the Resolves parameter ellipsis button to select a parameter name to resolve. If a custom procedure that has a filter (or filters) populates the control, the values list shows the parameters from the filters. If a data source populates the control, the values list shows all of the fields from the data source shown in the Object Inspector. The field name that limits the values for the next control in the chain, if a data source populates the control. The parameter name from the procedure, if a procedure populates the control. In most cases, this value will be populated by default and will not need to be changed. The parameter value is resolved in the chain if no filter is specified. An example of when to apply chaining logic is when a form offers two lists of dates so that you can select a FROM/TO date range. By chaining these parameters together and applying the Greater than parameter compare operator, this ensures that when a date is selected for the FROM parameter, only dates that follow the FROM date display in the TO date control, eliminating the possibility of selecting an invalid date range. Select the chaining logic option from the Parameter's compare operator drop-down list. This sets the compare operator to populate the control. The compare operator is applied to the parameter selected. Enable the caching option for the HTML page and all objects on the page. Enable cache run time data for a dynamic control or a condition. A chain contains conditions for each link in the chain. The conditions are linked to the values being bound to the control object. If you change the options for the condition, it will also be applied to the control, and vice versa. Caching options are turned off by default. From the Design tab of HTML Composer, select Options from the Window menu. The Developer Studio Options dialog box opens. Select the HTML Page tab. Click OK to close the Developer Studio Options dialog box. A chain contains conditions for each link in the chain. The conditions are linked to the values being chained to the control object. If you change the options for the condition, it will also be applied to the control, and vice versa. Create a dynamic input control to supply parameter values. For details about creating dynamic values, see Creating a Dynamic List of Values. Select the dynamic control object from the Parameters tab. The Properties and settings dialog box opens, showing the dynamic control options. Select Cache run time data to cache the run time data for the selected input control. Note: This setting overrides the Default caching option from the HTML Page tab. Select the center of the control object, drag the control to the center of the next control object, and release the mouse to complete the binding of the chain. When binding controls, the conditions inherit the values set in the dynamic control properties and settings. Click a link on the chain to open the Properties and settings dialog box for the condition. Select Cache run time data to cache the run time data for the selected input control. This option is only available for dynamic controls. This setting overrides the Default caching option from the HTML Page tab. When running the HTML page, data for the chained value is cached to improve performance. The following example shows how to create a report of the Gotham Grinds product sales for each category within each Region, State, and City. A chain consisting of the Region, State, and City controls. The values for the Region control populate the State control with the associated values, and the values for the State control populate the City control with the associated values. Multiple conditions for links in the chain. Conditions indicate that when Region is Southeast, the State control is hidden and the dependent City Values for Southeast are shown in the City control. Tip: The Gotham Grinds Sales data source (ggsales.mas) is available from the ibisamp Applications on localhost folder of Developer Studio. You may copy this source file to the project directory of your choice. Right-click and select New/HTML File. Type chaining_example in the File name text box and click Open. Create the Gotham Grinds sales report. Select New Report from the Insert menu. Click and drag the crosshair to create a reporting object and adjust it to the size you want. Select the ggsales Master File and click Open. Report Painter opens showing the field names for the ggsales data source. Select By from the Columns toolbar and double-click the following field names: CATEGORY, PCD, PRODUCT, REGION, ST, CITY, STCD. Insert your cursor after the Store ID field in the Report Painter canvas and select Sum from the Columns toolbar. Double-click DOLLARS to add it to the report. Create a list of parameters for the Region, ST, and City fields. These are the values you will be able to select when you run the report on the HTML page. Click the Where/If button from the Columns toolbar. The Report Options dialog box opens at the Where tab. Create a parameter for Region. From the Fields list, double-click REGION. From the Logical Relations drop-down list, select equals. In the Compare Type box, select Parameter. Double-click the Compare Value box to open the Variable Editor. Keep the default Name as REGION. Select Dynamic list from the Accept List section. GGSALES is automatically selected as the Source File and REGION is selected as Values for Return Fields. Create a parameter for ST from the Expression Builder. From the Fields list, double-click ST.
Keep the default Name as ST.
GGSALES is automatically selected as the Source File and ST is selected as Values for Return Fields. Create a parameter for City from the Expression Builder. From the Fields list, double-click CITY. Keep the default Name as CITY. GGSALES is automatically selected as the Source File and CITY is selected as Values for Return Fields. Click OK to close the Report Options dialog box. Select Close from the File menu to close Report Painter. When you are prompted to save your changes, click Yes. You are returned to HTML Composer and the New Parameters dialog box appears. Click OK to automatically add your parameter controls to the HTML page. Chain the controls to associate dependent values. When a control is automatically added to the layout with the New Parameters dialog box, it is associated (bound) to a parameter. The control object is bound to the parameter object, which means that the control will populate the parameter. In this example, the Region, ST, and City controls are not chained to each other and thus have no dependencies. If you run this report as is, no HTML output would appear since the controls do not know how to associate the related values. Select the center of the REGION control object, left-click and drag the REGION control to the center of ST control object, and release the mouse to complete the link. Select the center of the ST control object, click and drag the ST control to the center of CITY control object, and release the mouse to complete the link. Now the Region, ST, and City controls are chained to each other. The Region control starts the first link in the chain, chained to the ST control. The ST control starts the second link in the chain, chained to the City control. If you run this page, the values for the Region control populate the ST control with the associated values, and the values for the ST control populate the City control with the associated values. Create a condition for the ST control to be hidden if the Region is Southeast. Click the first link in the chain. The Value compare operator and Parameter compare operator is Equal. The multiselect operator is One of. Click the New icon to create multiple conditions for this chain link. Condition1 is created and the Selected values section is activated. Set the following options to hide the ST control if Region is Southeast. Click the Selected values ellipsis button and select Southeast from the list of values. Since this starts the first link in the chain, the list of Region values appear, as indicated from the Resolves parameter field for the condition. Select Populate, hide as the Action. Select Equal as the Value compare operator and Parameter’s compare operator. Select One of as the multiselect operator. The Resolves parameter is REGION. The following image shows the condition settings to hide the result of values (the list of State values) when Region is equal to Southeast. Create a condition to populate the City control with the dependent City values, when the State control is populated with States from the Southeast Region. Click the second link in the chain. The Value compare operator and Parameter’s compare operator is Equal. Condition1 is created and the Selected values section is activated. Set the following options to supply the City values when the States are FL, GA, TN (from the Southeast Region). Click the Selected values ellipsis button and select FL, GA, and TN from the list of values. Since this starts the second link in the chain, the list of ST values appear, as indicated from the Resolves parameter field for the condition. Select Populate, show as the Action. Select Equal as the Value compare operator. The Resolves parameter is ST. Select Greater Than or Equal as the Parameter’s compare operator. The following image shows the condition settings that the dependent City values will honor when the ST values are FL, GA, and TN. When Region is Southeast, the State control is hidden and the dependent City Values for Southeast are shown in the City control.